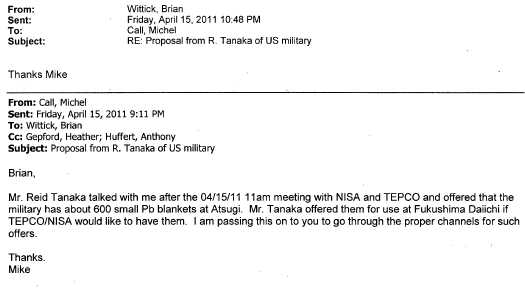 Mr. Reid Tanaka talked with me after the 04/15/11 11am meeting with NISA and TEPCO and offered that the military has about 600 small Pb blankets at Atsugi. Mr. Tanaka offered them for use at Fukushima Daiichi if TEPCO/NISA would like to have them. I am passing this on to you to go through the proper channels for such offers. April 18th, 2011 – Note DOE personnel (at the Embassy) are departing Japan this week.